On a news day that will undoubtedly by overshadowed by the news of the Department of Justice moving to block the AT&T/T-Mobile takeover the Blackberry Bold 9900 with 4G is now available through T-Mobile.com. T-Mobile’s first 4G Blackberry arrives for $299.99 with a two year agreement after a $50 mail in rebate. Immediate feedback has been less than pleasant regarding the launch price of this device so we’re hoping that T-Mobile drops the price soon after launch. In any case, if you’ve been eyeballing this device for months hit the link below or head on over to your local T-Mobile store and grab one! They were waiting for the suckers to buy it then drop the price. Maybe they’re. I’m one of those suckers with enough money to buy two of these outright. Bought it before release date and couldn’t have been happier. I’m selling my 9700, 9780 and 9300 and the my wife’s 9780. Keep spending your money like it grows on trees and soon your wife will have to be turning tricks to pay for your phone bill. If you read my comment it said “I’m selling my 9700, 9780 and 9300 and my wife’s 9780”. Also, the reason why I’m with Tmobile is because my bill is around 35%-40% less than any other national carrier. I bought mine at full retail as well. With all the money I save using T-Mobile’s plan vs. another carrier, I have extra money to justify spending it on a full retail device without having to sign a stupid contract. Good luck selling the thing without UMA (WiFi voice). The device does UMA. It’s just not supported by the OS yet. The speed at which updates are coming for OS7 on this device means it won’t be long. No UMA, Fixed focus camera (poor for close ups), and a sky high price = Fail In the last month moved from a 9700 to a HTC Sensation and liking it. Baffles me why T-Mobile is saddling the 9900 with such a high price point when the device actually does less than the 9780! Are you REALLY that lame? First of all, who is “Blackberry” ? There is no such company named “BlackBerry” or “Blackberry”. Second, nobody has any say over how much T-Mobile wishes to sell their products for, except T-MOBILE. Third, the price that T-Mobile sets for this device is not going to make anyone “go down in flames”, You’re either 11 years old or a complete moron. Maybe both. Not bad for a bb touch screen, but still pda style for a release price. The g2x was similar in price at release and no one really compained then…. People just love to complain. If you don’t like your job, leave it. If you don’t like you cell provider, switch. If you don’t like your car, buy a different one. $299 after rebate??? Is this a joke?? If you can’t afford it make payments. If you have to make payments, you shouldn’t buy it. Just a different choice that Tmo gives to people that other carriers don’t. i think it is not a matter of not having the funds but questioning the actual price of the phone ( i LOVE BB) but I must admit it is interesting to think that NEW android phones hit the market for $100 LESS and have more on board features… on the other hand ALL prices come down at some point! I bought one full price. For the amount of $ I pay every month it will get balanced in 4 months. If you can buy it, buy it. Great device. I tried using the 9780 after I played with the 9900 for like 15 mins and it seemed very awkward. T-Mobile phones have not been expensive like this since the Wing & Touch Pro 2. What does T-Mo think of when selling at this price? I believe they think you must pay a premium if you want to save every month. Do you go to MetroPCS and complain why their POS cellphone is $300 when their service and coverage are subpar? On the other hand, do you complain to Verizon why your bill is so expensive every month when you thought you saved a ton of money when you got the phone under contract for $199? People, this is great device. I agree it’s expensive. But that’s the price I’m willing to pay in order to keep my savings every month. My bill is $99 for two lines unlimited everything. Can you please tell me which other carrier does this? How do you keep your bill to $99? I’m close to $200 now, for myself and wife, with unlimited calling ($90), BIS x 2 ($40), unlimited texting ($25), plus fees, taxes etc. I looked at my previous bills and I used to get 188 and up. I was in a plan that I didn’t need. I’m on the Value Plus Plan. $49.99 per line x 2 = 99.98. Now, someone is going to say that I only got 2GB of data at full HSPA+ speeds. But like I mentioned, I only have what I need. If I could I would go to the 79.98 plan. But honestly 1000 minutes aren’t that many. Since there’s nothing in between I’m on the unlimited plan. And yes PR, taxes, insurance, international calling and all the other perks are extra. But it would be extra on any other company. That’s why I only gave my plan amount. Yo, Blackberry, for better sales, ask HP how to move overpriced tech. I believe Tmo set the price. Not RIM. Tmo set the price higher. But you save money monthly. Or if you would like to save $100 go to sprint for their CDMA (aka 2.5g) speeds and enjoy paying more every month. The black berry for sprint is evdo and is 3g not 2.5g. The speeds are good and sprint plans are pretty much the same. Were you drunk when you posted this? My bad. Go to Sprint and enjoy the 3G EVDO Rev A (WiMax less) BlackBerry Bold. And enjoy the “similar” prices on Sprint. Should I get the 9900 or 9780? The 9780 is a great device. Very pocketable, fast, great pictures, superb keyboard, etc and the list goes on. The 9900 is a great device as well. A bit bigger higher resolution screen, touch screen, HD camera, bigger keyboard and faster processor (are only a few upgrades). As mentioned above (or below depending how you sort things) I bought the 9900 because that’s what I wanted and sold my older devices. Could I’ve kept the 9780? Yes. Do I need to spend the extra money? No. Did I have the money? Yes. Do I think it’s a better device? Yes. I see this dropping price real quick….. But whatever you call it 3G or 4G it maxes out at 14.4Mbps. Which I think it’s pretty cool. ROTFLMAO!!!! Good luck with that price T-Mobile. Actually, I just checked the T-Mobile web store. The 9900 is already sold out…. They had had great luck. This device is solid… that price however makes me love everything else. Same here. Between the price and the lack of UMA and mobile hotspot features killed this for me. That is still way too expensive. Sprint is more reasonable. Sprints Bold is cheaper than this one. -Are the plans the same? No. I save $30 a month over a comparable plan from Sprint. Which means that the $100 difference would be washed out in 3.3 months. See? Your money will come out now or in the long run. No telco is out there to do you a favor. They’re out there to make a profit. And in my opinion it would be crazy to provide the cheapest phone and the cheapest plan. It’s one or the other. A blackberry that costs more than $100 with a contract ??. When did that happen??. 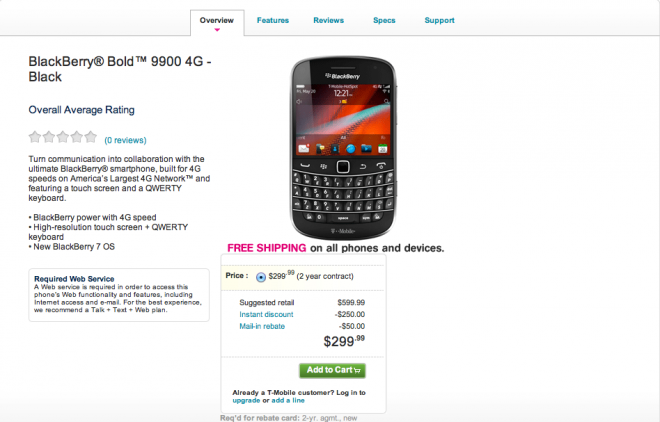 I think t-mobile is pissed with RIM and purposely pricing it above 300 to Kill it… RIM still doesn’t get it. In my opinion RIM is on another record year. Have you seen their sales from 2001 and on? Year over year they grow from 20%-30%. The market out-grew them but they’re still selling like hot cakes. even the iphone 3gs is better than this. they release the same blackberry 12 times each year and expect us to keep buying. most of us got tired of that back in 08 and 09. It’s not the same. Clean your lenses. Nobody is expecting for you to buy it. Do you go to McDonald’s everyday to eat the same hamburger just because they make the same one and forcing you to eat it? Little too little, little too late. AND NO UMA!!! I think they didn’t offer UMA on this phone because DT assumed Tmobile usa would be owned by AT&T very soon and THEY (AT&T) don’t offer UMA (wifi voice). I’d what for the curve. I like my cliq2 but I miss the great enterprise support and battery of my bb8900. one minute later the blackberry finally is loaded and into the OS. However, that happens when you insert the battery or do a full reset (alt, aA, del). But if you turn off the device and turn it back on, would you please tell me which other manufacturer boots faster than a blackberry? I’ve seen the mytouch line do this (fast boot) on their phones and I think it’s pretty cool. But I would like a full blown list. OK. The cheerleaders are here. If you are happy with your purchase, why badger the people who came here to vent about the BlackBerry Bold 9900’s price and missing features? I bought a Sensation at retail price, but didn’t feel the need to bash others who wanted to buy it at contract price or felt that the Sensation was lacking. I didn’t complain when the retail price dropped $50 in a month. Live and let live. If you are happy with your purchase of the BlackBerry Bold 9900 for $599, Yay! Let others who think that $299 ($349 +applicable tax out the door) is too much for this phone have their say. We, us, myself never said they can’t complain. I also believe this is a high price as well. But I’m willing to pay it. Everyone can say whatever they like (well almost). And the world goes on. Does Anyone Know if this BlackBerry9900 will BeComing Out in White?!?! i Believe i seen UK carriers were getting it in Black This Month & then White Mid-October. White is an excellent color and will look very nice on a device like the Bold 9900. It seems that At&t is the one for you. T-Mo BB $600 + (60×24) = $2040? At&t iPhone $199 + (85×24) = $2239? You’re right not much savings. BUT when you tell me what the $85 plan and Tmo’s $60 plan include we can talk. On another note, you don’t have to buy every two years from them. But if At&t is good for you then join At&t. My inlaws are with me in my plan. They only pay $15 dollars for each additional line with 500 minutes, unlimited text and data. I guess that makes it cheaper than Virgin Mobile AND on a national carrier. You’ve to compare Apples to Apples. Be happy man. Better times will come.